they are the “heart of our operation”! Kitchen Service- we provide a number of simple food items to our patrons such as beef on a bun, nachos, popcorn, soft drinks, coffee and other simple pre-packaged snack items. We require our kitchen volunteers to help prepare some of these items and sell them at the kitchen counter. The kitchen volunteers are required about an hour before the show and during the intermission breaks only. So you can usually watch most of the show. After the kitchen closes, cleanup is required and these volunteers also help tidy up the tables in the concert area. Bar Service- we offer our patrons the opportunity to purchase beer, wine and mixed cocktails. We require volunteers to staff the two bar service areas pre-show and during intermission breaks and sell drink tickets. After the show any left over products have to be stored away. Hall Setup- the Strathcona Hall must be setup with tables and chairs for each show by our volunteers on Saturday afternoon usually starting about noon. This activity normally takes about two hours. Other items such as stage and lighting system also have to be setup. Our sound service is provide by a professional production company but often our volunteers provide some assistance for set up and tear down. After the show the tables are not removed but the chairs have to be stacked and moved to the side of the hall. 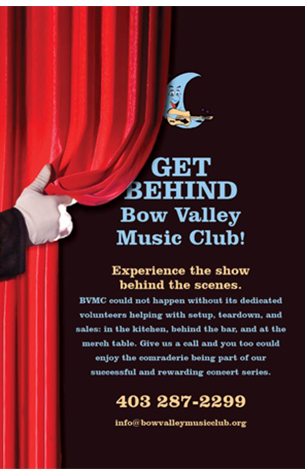 Volunteering at the Bow Valley Music Club provides a great opportunity to work with some great people and become involved in our shows. 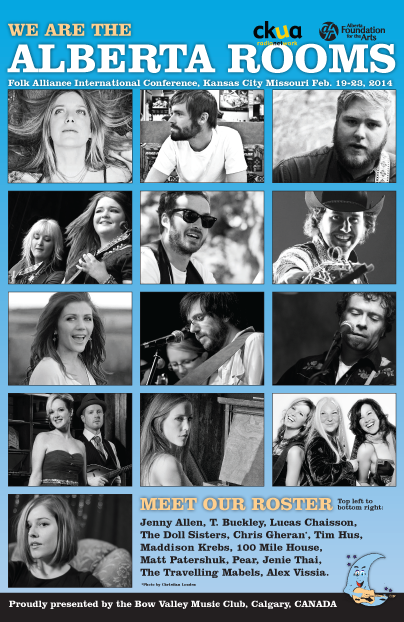 We welcome volunteers who are willing to work each of our 10 shows or who would perhaps be interested in working only a few shows or to be available to help out when called, i.e. if regular volunteer could not make a show.